Saturday, Mar. 31, 1888 After some snow during night (which left during day) pleasant & mild. Much as usual with our folks, & extra busy, Geo & Rosa (with Boys) both at funeral service of a "Mr Lane" in P.M. also at cemetery; quite lengthy procession with military music & flag, & one or more Orders. Quite as well self, & busy at more "repairing" with some extra picking up & usual chores with knitting eve. Sunday, April 1 Easter, very pleasant & mild, guess no extra service here in De Soto. 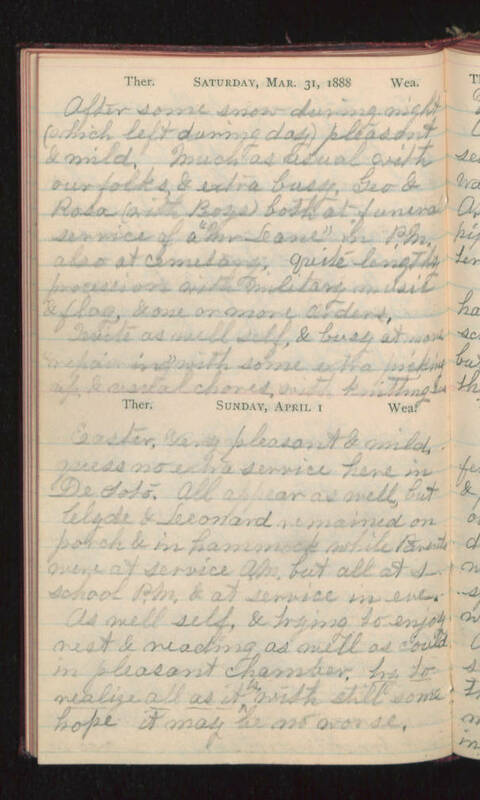 All appear as well, but Clyde & Leonard remained on porch & in hammock while parents were at service A.M. but all at s-school P.M. & at service in eve. As well self, & trying to enjoy rest & reading as well as could in pleasant chamber. Try to realize all as it is with still some hope it may be not worse.